The death rate from heart disease and stroke is now one-third the age-adjusted rate 50 years ago, according to the National Center for Health Statistics, a glowing tribute to the life-saving advances in medical technology, modern drugs, and lifestyle interventions. A poor person in the US today has access to much better health care than did a billionaire or prince in the 1950s. 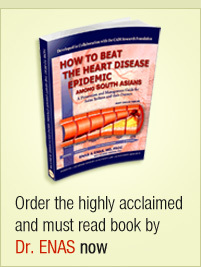 The CADI study demonstrated a 3-4 fold higher rate of heart disease among Indians in the US (Figure 010). 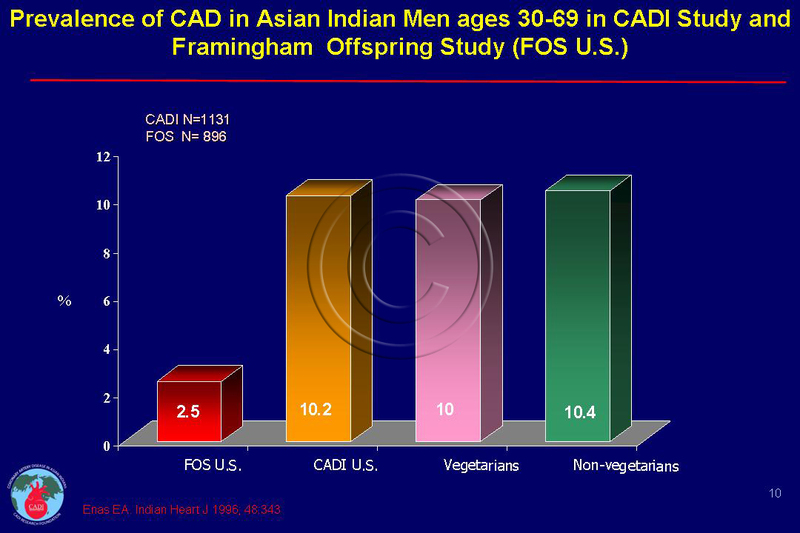 The age-adjusted prevalence of CAD among the 1131 men (aged 30-69 years ) was 10%, compared to 2.5% in the Framingham Offspring Study ─ generally considered a standard sample of the US population. More than 80% of CAD was angiographically documented. The rates were similar among subjects born in different states in India as well as among those settled in different states in the US although a tendency for higher rates among those from Kerala was noted. Vegetarians and non-vegetarians had similar rates. Among the Asian Indians studied, 75% were physicians and they had CAD rates similar to non-physicians. The 4-fold higher rates of CAD in Asian Indian physicians are in sharp contrast to the 5-fold lower rates of CAD among other physicians in the US. Among the participants of the Physicians’ Health Study, the CAD mortality (prevalence data not available) was only 22% that of the general US population. Prior studies among the 27 million Indian Diasporas (in countries as diverse as Canada, UK, Singapore, South Africa) consisting mostly of non-physicians had observed a 3-4 fold higher rate of heart disease, compared to the compatriots of other ethnic origins. Since the participants in the CADI Study were physicians and their family members, this study for the first time demonstrated that these high rates of CAD also apply equally to highly educated and knowledgeable physicians, including cardiologists. 1. Enas EA, Garg A, Davidson MA, Nair VM, Huet BA, Yusuf S. Coronary heart disease and its risk factors in first-generation immigrant Asian Indians to the United States of America. Indian heart journal. Jul-Aug 1996;48(4):343-353. 2. Klatsky AL, Tekawa I, Armstrong MA, Sidney S. The risk of hospitalization for ischemic heart disease among Asian Americans in northern California. Am J Public Health. Oct 1994;84(10):1672-1675. 3. Misra R, Patel T, Kotha P, et al. Prevalence of diabetes, metabolic syndrome, and cardiovascular risk factors in US Asian Indians: results from a national study. Journal of diabetes and its complications. Mar 18 2009.